Urdhva Dhanurasana – lifting from the floor, using the wall. Even though I’m using the wall, my buttocks still sinks. I can’t quite seem to get enough purchase through the feet to move the tailbone and sacrum in and up. Not too long ago, I was in a class where my teacher was taking us through some fairly intense backbends. I suffered my way through. I felt like my body was not yet ready for the more advanced presentations of Urdhva Dhanurasana and Dwi Pada Viparita Dandasana she was teaching. Why did I feel this way? Well for one, I felt like I was losing control of my legs. I couldn’t control my feet or my thighs, nor could I address any of the nuances of the pose. It was all and only about lifting myself up and then letting myself come down before I fell from exhaustion. Not very yogic, huh? 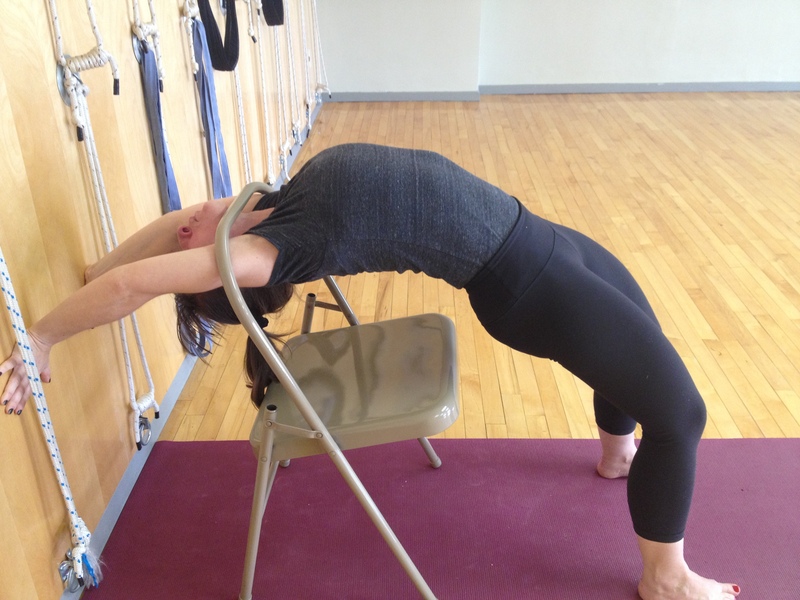 So… I swallowed my pride, backed up my poses and worked with a chair and the wall instead of lifting up off the floor. Even still, I had trouble controlling my limbs. Urdhva Dhanurasana – lifting up from the chair. In this version, my buttocks isn’t sinking quite as much, but my thighs are splaying out despite all my efforts to roll them in. However, these presentations at least gave some boundaries to my pose. I felt good about the decision and quite honestly I’m comfortable with the fact that for me, right now, this is where I’m at with these particular poses. That said, I’d absolutely like to move beyond this place. I’m determined to, one day, do a better backbend. I began to wonder if practicing these poses more often would help me improve. My gut response was that actually, no, I don’t think I need to practice these poses more often. In fact, I felt that I needed to practice other poses more often. Given how challenging these poses are for me, I wondered if this was a cop out or if there was truth to how I was feeling. I consulted my books and my practice and decided that my logic was sound. I also concluded that the number one thing holding me back from doing better backbends was/is the fact that my middle groins are exceptionally tight. So for now, my plan is to address my tight middle groins in an effort to improve my back bends. Here are some photos of things I’ve recently inserted into my practice to achieve this end. This version of Tadasana with toe mounds raised and using the wall ropes for extra support is a highly accessible way for me to bring the focus to my middle groins. Supta Virasana, Bhekasana, & even the back leg of Virabhadrasana I are not particularly accessible to me. This gives me another way to access my middle groins. Matsyasana is much more available to me than poses like Supta Virasana or Paryankasana and allows me to really open up in the middle groin area. Below are some excerpts from a talk BKS Iyengar gave on Backbends. These words have been highly instructive and illuminating for me. I hope you enjoy them as well. Happy backbends week!! “Backbends give stability to the body and bring maturity in the intelligence in order to develop ripeness in the brain and ripeness in the emotions”. 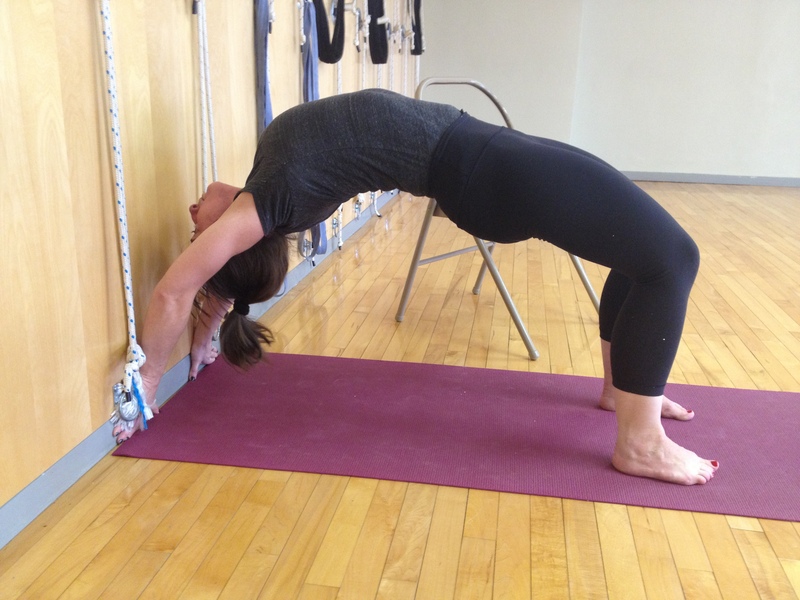 What is your experience with backbends? Care to share any tips, thoughts or experiences? Tight front groins are definitely a problem of mine, so thank you for these great suggestions! I also find that I’m learning a lot about the groins from Pada Rajakapotasana. Yes! Eka Pada Rajakapotasana is awesome for that! I love that the floor acts as a barrier preventing my thigh from falling forward (as it tends to do in for ex. Vira 1). Thanks for the follow- I also love your blog! This posting of Iyengar on backbends is great. These poses are part of the backbend recipe for me! For chest openers- Fish Pose, Purvottasana, Up Dog, Cobra, Danurasana, Camel, even Twisting Prayer – all twists, really are good to open the side body- which helps open the chest!